1. Preheat oven to 325�F. Combine graham cracker crumbs, 2 tablespoons sugar and melted butter in medium bowl. Press crumb mixture evenly onto bottom and about 1-1/2 inches up side of 9-inch springform pan. Bake 8 minutes. Remove from oven. 2. Increase oven temperature to 350�F. Beat cream cheese, remaining 1 cup sugar and vanilla on medium speed of mixer until well blended. Add sour cream; beat on low speed until blended. Add eggs; beat on low speed just until blended. Do not overbeat. 3. Pour half of filling into prepared crust. Reserve 1/3 cup cinnamon chips for drizzle. Sprinkle remaining 1-1/3 cups chips evenly over filling in pan. Carefully spoon remaining filling over chips. Place on shallow baking pan. 4. Bake about 1 hour or until center is almost set. Remove from oven; cool 10 minutes on wire rack. Using knife or narrow metal spatula, loosen cheesecake from side of pan. Cool on wire rack additional 30 minutes. Remove side of pan; cool 1 hour. 5. Combine shortening and reserved 1/3 cup chips in small microwave-safe bowl. Microwave at MEDIUM (50%) 30 seconds; stir until chips are melted. 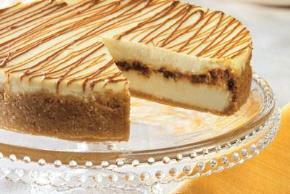 Drizzle over cheesecake; cover and refrigerate at least 4 hours. Cover; refrigerate leftover cheesecake.